Spellbinding atmospheric lighting accessory! The mirrored ball IS LIGHTED FROM WITHIN! 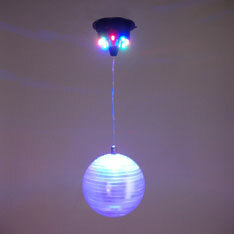 The rotating ball softly changes colors while bright LED lights shine on it from above! A lovely dance-floor effect that plays on walls and ceilings. Boxed and sold individually with 110V adapter. Click here for a video demonstration! (443kb wmv file). $14.55 each for 9 or more. $12.90 each for 18 or more.